I’m a violinist, teacher and author based in Pasadena, California. By day and night, I’m First Associate Concertmaster for the Los Angeles Philharmonic. The rest of the time, I’m a husband and father of three. To read my professional bio, click here to skip to the end of the story. I grew up in Lexington, Kentucky, and both my parents were flute teachers. My dad taught at the University of Kentucky, while my mom taught privately, mostly junior high and high school flutists. Most of my parents’ friends were musicians too, so I assumed that everyone played an instrument. Whenever I asked what my instrument was, my parents would smile, but eventually they knew that they would need an answer for me. I learned to use our record player so that I could listen to the music my parents had in the house: some classical, some jazz, and of course the children’s songs that I liked. Before I went to kindergarten, I would sometimes come with my dad to work, sitting in his studio while he taught his students. Or I might make the longer drive to Frankfort with my mom, watching her teach as well. I could tell that my parents loved helping their students play better, even if it took several different ways of trying the same thing. They were very patient and they never gave up! When I was four years old, my mom took me to a class called Suzuki, where about ten of us got “violins”! That’s in quotes because they weren’t really violins. They were boxes of Cracker Jack wrapped in brown paper! They had rulers taped to them to act as fingerboards. And each of us got the cardboard from a coat hanger to use for a bow. We each had a “foot chart” as well that showed the proper places for our feet while we played. We learned how to hold our instruments, how to place them under our chins, how to hold our bows, and how to bow at the end of a song. And what were our songs? They were just rhythms, of course! Now I’d call them bowing exercises. At the end of this first series of classes, the teacher, Donna Wiehe, asked us to unwrap our violins. I imagine there was a mixture of excitement and disappointment when we realized what we had been “playing” on. But of course, our parents had a surprise for each of us: a real violin and bow, inside a real violin case. Mine was 1/16 size, and my parents still have it today. Nathan (in Mickey hat) in Suzuki class, 1982. My mother at top left. Every day, my mother practiced with me, just 20 minutes a day at first. She often played the flute along with me, so that I could hear where the notes were supposed to be. I also had little colored pieces of tape on the fingerboard so that I could see the places for my four fingers. My bow also had stickers on it so I knew where the half and quarter points were! I never liked practicing very much, but I did like playing the violin. I liked playing fast songs the best, but I got easily frustrated when I didn’t sound the way my Suzuki record sounded. Luckily, my parents were just as patient with me as they were with their older students. So was Mrs. Wiehe, who taught nearly 80 of us weekly half-hour lessons. Before long, I got to perform my songs in front of other Suzuki kids and parents. 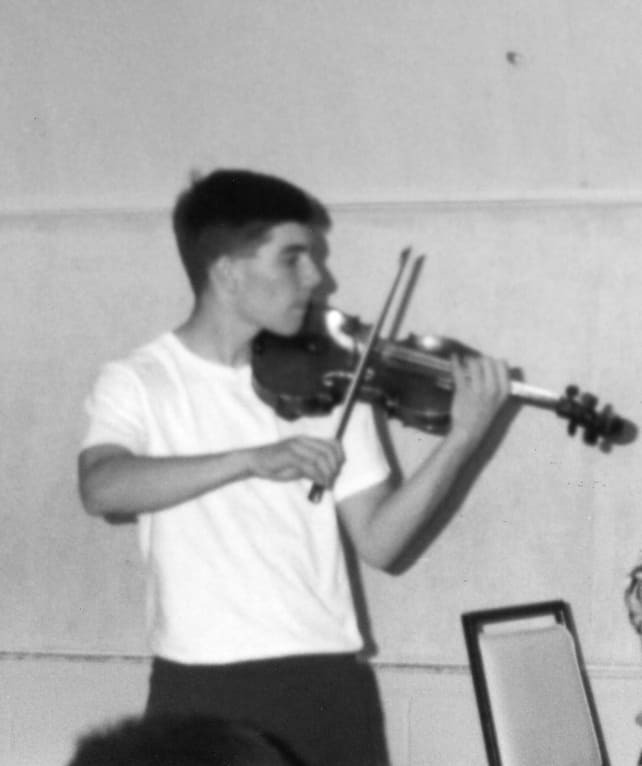 When I was about 12 years old, I started attending summer programs for the violin, “music camps”. Finally I got to meet other kids from around the country who played as much violin as I did, or in some cases much more. There were kids who practiced four hours a day! I was still practicing just one hour. These kids were playing much harder pieces than I was, and they entered national competitions, something I had never done outside of some local Kentucky contests. Around this time, since I had finished the ten Suzuki books, I said good-bye to Mrs. Wiehe and started taking lessons with the professor at the University of Kentucky, Daniel Mason. 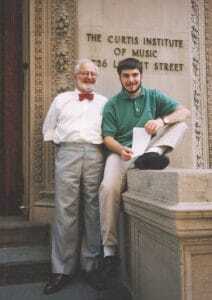 He had studied with the great Jascha Heifetz (although that didn’t mean much to me in the beginning)! All of a sudden, things got a lot tougher. I was playing more difficult music, “grown-up pieces” as Mr. Mason liked to say. And I had to learn them more quickly. I was also practicing on my own, writing down what I worked on each day. What I didn’t know was that my parents and Mr. Mason had agreed to give me no more work than I could accomplish in two hours a day. And when it came to choosing summer camps, they steered me away from the most intense ones such as Meadowmount and Encore, also known as “practice prisons”. I happily agreed; I still hated practicing! But these were the years that I learned scales and etudes, double-stops, spiccato and all the other bow strokes. Mrs. Wiehe had given me the gifts of pitch, rhythm and joy on the violin. Mr. Mason laid the foundation for a virtuoso technique. His lessons are the first ones I can remember clearly. I also remember that I wasn’t driven like the teenagers that I met during the summers. I wanted to play the music I loved, but I practiced only to solve the problems that were directly in front of me. I didn’t exactly push myself to be the best that I could be! 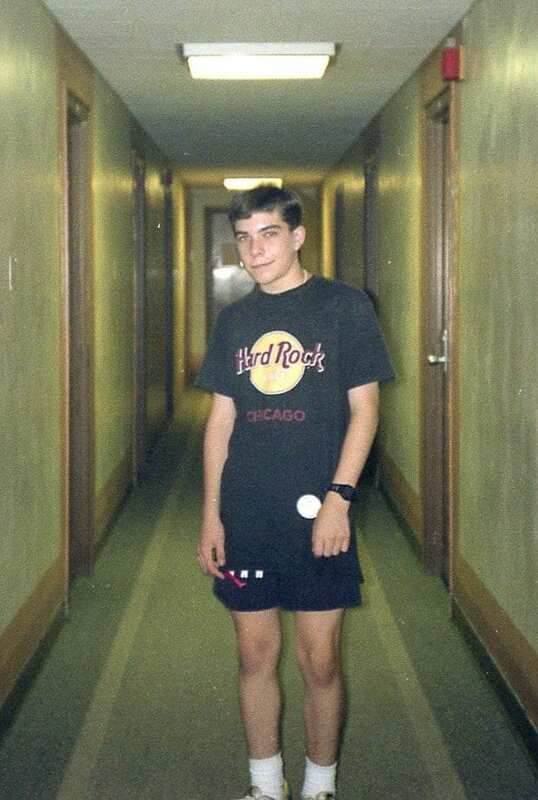 Things got more serious when I was 15. At that point I had to choose whether the violin was something I really wanted to do in college, and perhaps for the rest of my life. I wasn’t playing many concerts for money, and there was still time to change direction if I wanted. But that summer, I heard a great orchestra regularly for the first time: the National Symphony, during a three-week summer session in Washington, D.C. I also had a teacher there who insisted that I practice two hours a day. While that was tough, it showed me that I could learn music more quickly and more thoroughly when I put in the time. In short, I knew that I could get a lot better and I finally wanted it for myself. I had heard from my father’s father about the Curtis Institute of Music in Philadelphia, since he had been a flute student there in the 40s. He went from there to the Philadelphia Orchestra, and finally to a teaching career at the University of Wisconsin in Madison. My parents met while studying with him there! Mr. Mason agreed that Curtis was a great school, but so were many others. The audition requirements for Curtis, however, went far beyond those of other schools: two concertos, a solo sonata or partita by Bach, a Paganini caprice, and even scales. Therefore, by practicing for the Curtis audition, I would cover all the other auditions as well. I had my work cut out for me. Those last few years living and practicing at home started my love/hate relationship with the tape recorder, a device I still consider indispensable for great practicing! By the time my auditions at four schools rolled around during my senior year of high school, I was definitely tired of my audition pieces: Mozart concerto No. 4 in D, Vieuxtemps concerto No. 5, Bach C Major sonata and Paganini Caprice No. 21. 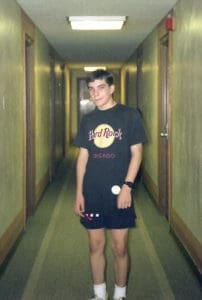 I was ready to get out and see the world too, no matter which school I went to! But Mr. Mason devised all kinds of practice strategies to keep things fresh and to raise my level. January and February were exciting months. But eventually, audition season ended and winter gave way to spring and the end of high school. In between AP tests at school and pickup basketball games in the neighborhood, I waited for letters and phone calls. When I finally got the call that I would go to Curtis the next year, I was elated. I had arrived! When I actually did arrive at Curtis, alone in my one-bedroom apartment, with no food in the fridge and nobody to cook it for me in any case, I realized that I had some catching up to do. I may have learned some difficult music for the audition, but if I was going to keep up with the other students, my days of practicing two hours were over. So were my days of learning from a teacher who showed me how to practice. My Curtis teachers weren’t greatly concerned about the process, only the weekly results! Or at least that’s how it seemed to me. Suddenly playing didn’t seem as much fun. Luckily, I discovered chamber music at Curtis, string quartet playing in particular, and so I had just the outlet I needed when solo playing felt like a dead end. Orchestral playing was a big deal at Curtis as well; between the full group rehearsals, sectionals and performances we met four times a week. The great Otto-Werner Mueller headed the orchestral program, towering over us physically and musically. I recalled those National Symphony performances, and Cleveland Orchestra performances in later summers, that had drawn me further into music. I decided that the orchestral life was for me. At that time, not many of my friends were auditioning for orchestras, but a few were, and I started noticing how they prepared for their auditions. The subject fascinated me (and still does)! My first audition was for the “local band”, the Philadelphia Orchestra. How amazing would it be to join the same great orchestra that my grandfather had played with right out of school? But it was not to be. Although I practiced five hours a day for a month, and the first round went well, it all came crashing down in the semi-final round. My preparation had been totally insufficient. I was inexperienced after all, but there was much more to it than that. I simply had never thought about what might make a successful audition! And without asking that question, or knowing the answer, I would never have the success I craved. My disappointment after the Philadelphia audition lasted several months, and I had almost given up the idea of taking more auditions, until an interesting one came up: for principal second violin of the Saint Paul Chamber Orchestra. The repertoire, the excerpts, for this audition seemed “friendlier”, and even the name of the group promised something in between an orchestra and a string quartet! I didn’t have as much time to prepare as I had for Philadelphia, and I even had to take a 5 AM flight to the Twin Cities the morning of the audition. But sometimes adverse conditions help you to relax, so for whatever reason I was much more comfortable this time around. I landed my first job in Saint Paul! Ever since that first day at work, I’ve had wonderful adventures as a member of of Saint Paul, Chicago and Los Angeles. You can read those stories here at natesviolin.com! I’ve also won and lost plenty of auditions. And over the years I’ve worked to discover the answers to audition questions: Why do great players lose auditions? What are committees really listening for? Is there one best way to prepare for auditions? Now I help others reach their potential on the violin, whether they’re taking auditions or not. I can help you no matter how long you’ve been playing, or how long it’s been since you played. Whatever music you want to play, I’m here to tell you that it is possible! Step by step, you can reach the places you want to go. But you need a guide, someone who’s been there before. You’ve heard my story, now let me hear yours! Click below to tell me who you are, what you’re working on, what places you want to go. Then let me help you get there. 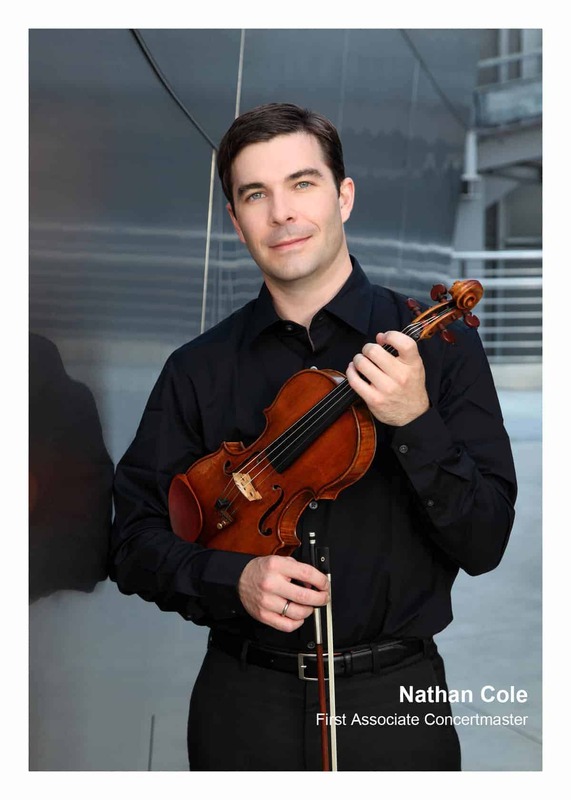 Nathan Cole, First Associate Concertmaster of the Los Angeles Philharmonic, has appeared as guest concertmaster with the orchestras of Pittsburgh, Minnesota, Houston, Ottawa, Seattle, and Oregon. He was previously a member of the Chicago Symphony and Principal Second Violin of the Saint Paul Chamber Orchestra. A native of Lexington, KY, he made his debut with the Louisville Orchestra at the age of ten while studying with Donna Wiehe. After eight years working with Daniel Mason, Cole enrolled at the Curtis Institute of Music. In addition to his studies there with Pamela Frank, Felix Galimir, Ida Kavafian, and Jaime Laredo, Cole formed the Grancino String Quartet, debuting in New York’s Weill Hall. Several summers at Marlboro enriched his love of chamber music. While in Chicago, Nathan taught at Roosevelt University and coached the Chicago Civic Orchestra. He is currently on the faculty at the Colburn School for the Performing Arts, with classes at the Colburn Conservatory and USC. His articles and photographs have appeared in Strings, Symphony, and Chamber Music magazines. Nathan is on the faculty of the Colburn Community School for Performing Arts.